The Vitality Institute Medical Products four revolutionary professional medical grade chemical peel treatments designed to achieve dramatic results after just one peel. Each of the four different chemical peels are safe for all skin types and conditions. The VI Peels can be used as frequently as once a month to treat patients suffering from severe cases of Melasma, acne, and scarring to effectively repair, resurface, and renew the skin until desired results are achieved. Once optimal results are achieved by a maintenance series of 3 to 4 peels a year are recommended accompanied by the appropriate daily care products to address the patient's skin care concerns. Anti Aging: Our peels reverse the effects of sun damage, environmental factors, and time. Our peels are designed to enhance the skins natural beauty and luminosity. Acne: VI Peel Acne addresses the main causes of breakouts; killing p. acnes, clearing impurities and calming inflammation. Hyperpigmentation: Our treatments dramatically improve melasma, PIH, and UV induced hyperpigmentation. Sensitive Skin: The VI Peel treats sensitive skin conditions including rosacea, eczema and psoriasis. Comfort: The VI Peel is formulated with a numbing agent making them virtually painless. Convenience: Each treatment takes less than 20 minutes enabling the patient to return normal daily activities immediately. Minimal Healing Time: Patient’s enjoy healthy, youthful, beautiful skin in about one week. 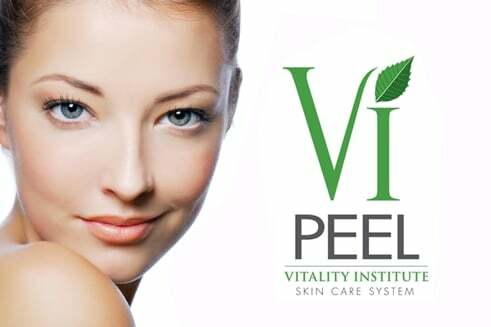 "Look and feel great with our Vi Peel treatments!"